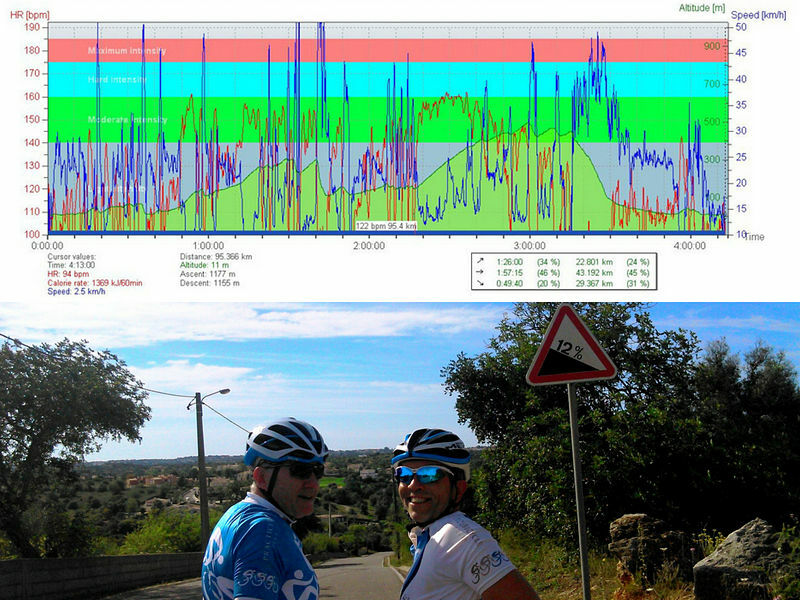 The roller-coaster ride during the Algarve cycling week! Your spoilt for choice with Algarve cycling training although I think it was my most taxing ride for the week, it’s a little more challenging, the views are varied, and the isolation is unreal. It’s Day 5 of my Algarve cycling training week, I was looking for a BIG week and I certainly have had it, my legs hurt, I’m feeling exhausted, but the encouragement from the ride leaders at Practicebicycle is amazing. To accomplish the challenging week of rides, the cycling support, I have felt like a Pro! You don’t have to have a big understanding of cycling training, although a simple piece of valuable equipment called the Heart Rate monitor (which I didn’t use prior to my week cycling in the Algarve) made so much more sense during the weeks rides, with the testing terrain and what was happening to me on my bike, thanks for detail number 1. Detail number 2; it’s not a race this is real training, there is no keeping up with anybody, as I was re-assured it was ‘my week of challenges’. Detail number 3; the rides are all brilliant in different ways, from the ocean to the hinterland to their ‘little mountains’ but my favorite for the week was the ride over Alto do Corchas. Start at an easy tempo riding out of Portimao over the River Arade towards the little fishing village of Parchal passing the tiny white washed village of Estombar. The views start to change as the landscape in the distance look like little ‘rolling golf balls’. We’re climbing now, nothing like the French Alps, they call it the ‘Algarvian Alps’ the bumps, continue and before we know it we’re on great cycling roads used for the early season professionals at the Volta ao Algarve Bike Race that takes place each February. It’s easy to forget about the discomfort and enjoy the panoramic views…so many from the climbing to the descending, small streams to dense forests, views in every direction, I feel on top of the world. It’s always a good time for a café stop, before we really hit the ‘roller-coasters’! What an unbelievable ride full of perfect challenges!